White/off-White, long sleeved thermal style shirt with vertical ribbing, horizontal seam across the chest, and U or V shaped collar. Black patches under armpits. Gray/White shirt-style Tunic or bib that fills the collar gap. No tee shirts or tank tops. Three-sectioned brown shoulder pad fitted to right shoulder, can be removable or permanent. Should be made from leather/suede, or leather/suede-like material. Soft athletic padding is acceptable if the sectional design matches, and it is painted to resemble the appearance in the comic. Not required if jacket is worn. Short black driving-style gloves with holes along the tops of the fingers and open space on back of the palm, with snap closure near wrist. Black leather or leather-like forearm bracer. Snaps or Velcro closure, no laces. (Bracers not required if jacket is worn). Long, black pilot-style gloves that extend to cover the forearms. Gloves should be made of leather or leather-like material. Black pants with cargo-style pockets on the outside of both legs, two back pockets. Leather or military web style, black. Large silver buckle with two silver rectangles on the left and right side of a circle. Pouches: At least 4 small pouches (two in front, two in back). Saber Clip: D-clip hook, should be fitted to left side of belt, near the hip. Brown leather drop-down holster attached to right hip, extending down to the thigh. 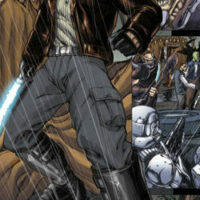 Black leather Jedi-style boots, mid-calf, but not above the knee. Longsword-style two-handed saber hilt. The lightsaber may be a static prop (hilt-only). Attached blade(s), LED lights, and sound effects, are allowed but not required. If bladed, blade is blue. (No toy sabers, no Ultimate FX short saber). Short brown/black hair, trimmed beard. 1. Cloak: Brown flight jacket, waist-length. Stand-up collar with small lapels, horizontal pocket slits near bottom of the jacket. Horizontal seam across the chest, and across the shoulder blades in back. Vertical seam up the center of the spine, ends when intersecting with shoulder seams. May be made from leather, cotton, or canvas material. If made of leather, must be weathered and faded, if cotton or canvas, must be waxed to have slight gloss. 2. Blaster: Bryar Blaster Pistol.